Solar roof tops and other large environmentally-friendly energy projects do, more often than not, pay for themselves fairly quickly and then can start saving you money in the long run, too. The problem is that these major changes -- because of the high initial investment required and complexities involved with integrating these concepts into homes -- are still out of reach for many hard-working families. The good news is that there are still some very eco respectful energy producing products that are also affordable to the average consumer, including most families. Two such brands offering inexpensive eco energy solutions are ClearLite's ArmorBulb with Eco Safety Coating and Fuji EnviroMax Digital Alkaline & Super Alkaline Batteries from Fuji Batteries. The two companies are separate but their products have common qualities, both protective of the environment as well as more efficient than their traditional counterparts. Energy Star, a joint program of the U.S. Environmental Protection Agency and the U.S. Department of Energy that helps both business and home energy consumers save money while also protecting the environment through energy efficient products and practices, says that a large amount of energy can be saved by simply changing the type of light bulb that is used in our homes. "If every American home replaced just one standard light bulb with an Energy Star - qualified product," the agency says, "We would save enough energy to light 3 million homes for one year." That's a huge savings for just changing one bulb each, don't you think? 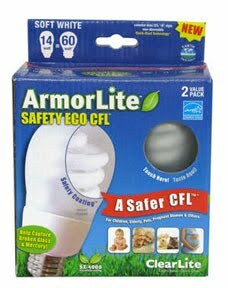 ClearLite's ArmorBulb, for example, carries the Energy Star seal on its packaging because these are designed for increased energy efficiency and long life: 14W = 60W providing 10,000 hours. What sets this patent-pending innovation apart from the commonly found spiral CFLs on the market today, though it the by appearance alone it looks similar in shape to a regular light bulb. The cross section view at right, shows the interior of the bulb which it is actually a compact fluorescent light (CFL) bulb encased in a glass bulb-shaped safety coated cover. In case it is accidentally shattered, this safety coating is designed to help capture broken glass and mercury -- the later component of which can cause neural damage in developing fetuses or young children if the vapor is inhaled. 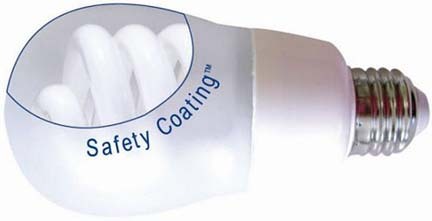 In addition to using the SX-4000 Eco Safety Coating, ArmorBulb does not use liquid mercury and instead uses amalgam, so it is a safer CFL for use around children, the elderly, pregnant women, pets, and anyone whose health is fragile. Switching from traditional light bulbs (AKA incandescent) to CFLs have proven to be effective and this is a really small change everyone in America can make right now. "Making this change will help to use less electricity at home," explains Energy Star, "and prevent greenhouse gas emissions that lead to global climate change." Energy Star, which is not affiliated in any way with ClearLite or ArmorBulb, encourages consumers to make the most energy efficient decisions whenever purchasing related items for consumer use. The Energy Star website recommends that, "If looking for new household products, look for ones that have earned the ENERGY STAR. They meet strict energy efficiency guidelines set by the EPA and US Department of Energy." For more information on CFLs, a PDF down loadable file from Energy Star is available here. The three types of Fuji EnviroMax 1.5 Volt batteries that were also submitted for this review -- Digital Alkaline AA, Digital Alkaline AAA, and Super Alkaline AA, are kinder to the planet, too. EnviroMax Digital AA & AAA battery types are both made to last longer -- making them ideal for high drain electronic gadgets such as digital cameras, MP3 players, hand-held gaming devices, and other small equipment. According to the Fuji's EnviroMax Super Alkaline AA Battery package information, these too are eco-respectful since they're manufactured under an ISO 14001 Certified Management System in addition to meeting or exceeding the power of most alkaline batteries and having a shelf life of up to seven years. The fine print on the package of all three types of EnviroMax batteries MommyBlogExpert examined says that these are all produced under sustainable and eco-friendly standards using recycled paper and PET plastic for packaging. No ozone depleting compounds are used in the manufacturing process, either, meaning that materials such as mercury and cadmium -- both which are hazardous to the environment -- have been eliminated from the actual products. Additionally, Fuji states that each of EnviroMax products reviewed for this post are also PVC free. Whether talking about eco-friendly lighting, batteries that offer maximum power with minimum impact to the environment, or other sources of power, energy efficient choices such as these are proven money savers that don't sacrifice features or comfort. MommyBlogExpert adds the following caveat -- always read labels carefully when purchasing green products, including the ones reviewed for this blogpost, and take the extra time to comparison shop as product features and pricing can vary widely. As is typical with other brands marketing green products, both manufacturer's offerings reviewed here cost more than the traditional, less eco-friendly alternatives. For example, ClearLite ArmorBulbs are currently listed on Amazon at $7.99/1 bulb and $14.99/2 bulbs. Fuji EnviroMax Battery 4-packs, depending on the type, range from $10.86 - $11.37 on Amazon. More information on the products mentioned, as well as additional background may be found on the two separate manufacturer's websites: ClearLite and Fuji Batteries. FTC Disclosure: MommyBlogExpert received the products discussed in this post for review including ArmorLite Safety Eco CFL Light Bulbs from ClearLite and the Fuji EnviroMax Digital and Super Alkaline Battery packs. MommyBlogExpert did not receive any payment or other compensation associated with this post. See complete FTC Disclosure information that appears at the bottom of MommyBlogExpert's main page and at the bottom of every individual post on this blog, including this one.